Puddles in the Yard: A sewer line leak can produce odd puddles in the yard. They’ll often appear in areas that have no other corresponding cause. Excess Greenery: The plants and grass in your yard will use a leaking sewer line as a source of fertilization. 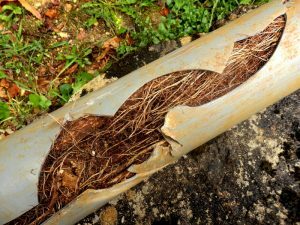 As we mentioned above, it’s even possible for tree roots to break through and create fissures in your pipes. Slow Moving Drains: A clogged pipe or backup in your drains isn’t that uncommon in your home. When your sewer line is backed up, though it’ll probably leave all the drains in your house slow or nonfunctional. This is definitely not something that should be ignored if it happens in your home! Mold and Bacteria Growth: Leaks in your sewer line can mean an explosion in mold growth and bacteria in your home. It’s never a good sign to have this on your property as it can make you ill, particularly if you already suffer from allergies or asthma. Running Water: A sewer line leak can produce the sound of running or dripping water sometimes. The sound will usually be localized somewhere where there shouldn’t be any running water. Foul Odors: As you’re probably very well aware there is a high level of gasses and similar odorous components that travel through your sewer line. If there’s a blockage or backup with this plumbing pipe, you’ll probably pick up on these strange odors. Cracks in Foundation: Any liquid released from a sewer line can create pressure that damages the concrete of porches and pools, and may even impact the foundation of the home itself. Cracks typically indicate a problem that’s been around for awhile. Sinkholes and Divots: If the ground around your sewer line is saturated with too much fluid, like form a leak beneath its surface, it can easy shift, resulting in divots in your yard—or even worse, a sinkhole, which can be dangerous. Call the super friendly team at Admiral Plumbing for exceptional service!